The name "Ironman" has been used by a few organisations over the years. While Aussies are familiar with their own version of Ironman which combines the four main disciplines of surf lifesaving into a single race, most of the world associate Ironman events with the long-distance triathlon races organised by the World Triathlon Corporation (WTC). The first event of this type took place in 1978 when founder John Collins travelled to Waikiki in Hawaii to take on the first-ever competitive Ironman challenge with fourteen other competitors. According to Collins, "Ironman is about persevering, enduring and being a part of something larger than ourselves. It shows the heights that can be achieved when we push beyond our boundaries and go the distance." It's exactly this kind of transcendent attitude which attracts so many middle aged men, with amateur and professional Ironman events regularly taking place across the world. Whether you're looking for rejuvenation, a sense of peace, or that feeling of eternal youth that only extreme exercise can provide, Ironman is one of the best ways to push your physical limits while coming to terms with your own mortality. According to Canadian psychologist Elliot Jacques way back in 1957, getting older triggers an existential introspection that often leads to anxiety, stress, and depression. The old midlife crisis was a desperate bid to feel young again, with people looking back and trying to replicate what they had lost or never had in the first place. The new midlife crisis could just as well be called a midlife correction, with people actively seeking to push their physical limits as a way to stretch their youth rather than make a doomed return. Instead of getting depressed about all the things we haven't done or worrying about how much time is left, the new midlife crisis allows us to look forward as we re-shape our future. 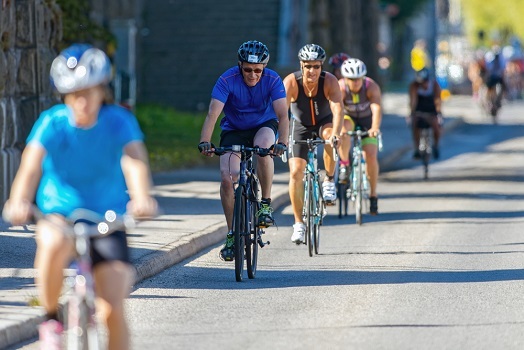 According to data from the WTC, almost a third of all triathlon participants in the US are between the ages of 40 and 49, making it the single largest demographic. A similar trend is being seen with regular and extreme marathons, and also with personal and group training sessions for busy middle aged executives. Rather than settling for a lazy sedentary lifestyle, more and more professionals are looking to increase their endurance and improve their strength through cycling, swimming, and weights programs. While completing an Ironman event is not everyone's end goal, personal trainers are a great asset for anyone who wants to get to the finish line of any life event with minimal disruption to their busy lives.